Origin and Habitat: Sesamothamnus lugardii is found in several separated populations from the Transvaal Lowveld (Kruger National Park) through the northern Transvaal in Southern Africa to the south of Zimbabwe and the east of Botswana and southern Namibia. Altitude range: 180 - 1500 metres above sea level. 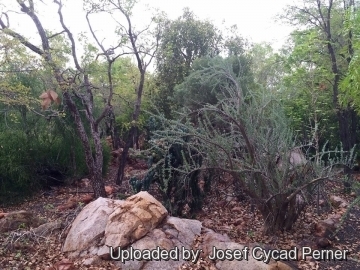 Habitat: It grows singly or in scattered, small groups in hot dry areas on calcareous soil in open, sandy Acacia Bushveld or between rocks, in scrub communities, sometimes being the dominant woody plant. The elephants have been known to eat parts of the tree, and sometimes to uproot it. Description: Sesamothamnus lugardii is a grotesque spiny shrub or small caudiciform tree which looks like a 2-3(-5) m high baobab. It has an exceptionally thick, swollen trunk which always subdivides near the ground in few main branches tapering rapidly towards their tips to form a sparse canopy. 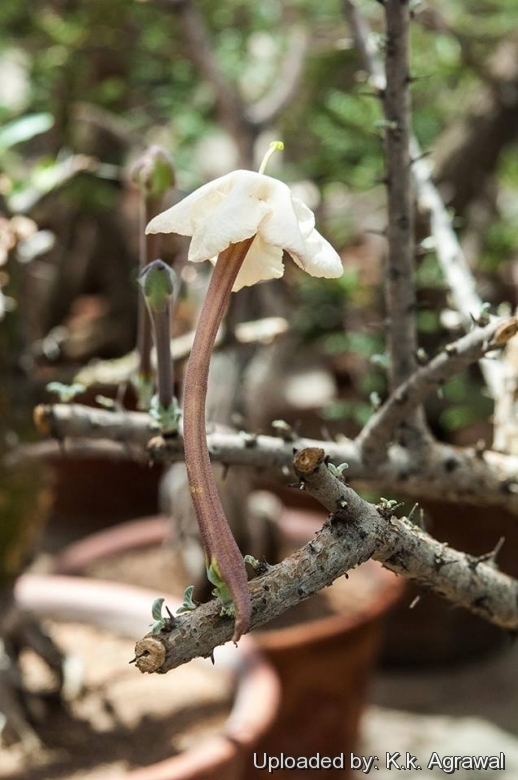 The flowers of this species are unique, beautiful trumpet-shaped, but unfortunately very few are produced. 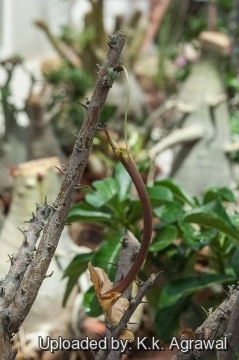 Each consists of a particularly long, thin, red-brown corolla tube which is elongated at the base into what is known as a 'spur', which extends beyond the flower's junction with the twig. Stem (Caudex): Succulent-like, very swollen at the base, up to 1 m. in diameter. It branches very low down into a few thick, semi-erect branches that divide into thick branchlets that taper rapidly towards their tips. Bark golden-yellow fairly glossy, marked with black, peeling off in small flakes, to show shiny green under-bark. The bark becomes darker towards the ends of the branches. The branches have dark knobs and stiff thorns. The timber is soft, fibrous and worthless. Thorns: Single, short, set spirally on the twigs 5-10(-15) mm long, straight or slightly curved growing on twigs and branches. Initially they are soft with leaf-like appendages, but later become hard and sharp. Leaves: Deciduous, simple in tufts on knobs, in the angles made by the spines, or forming tight, sparse sleeves around short branchlets and twigs, oblong to obovate, 1–2.5 cm long, 4–6 mm broad, blue-grey-green, semi-coriaceous, with under-surfaces covered by many, tiny, star-shaped hairs that give a powdery appearance when young. Petiole very short . Margin smooth. Tip rounded-to-notched. Base tapering. Midrib and veins, distinct below, impressed above without hairs. Flower: Striking, sweet-scented, single or up to 3 in short raceme-like inflorescences on short shoots which are sometimes elongated. Pedicels 4 mm long. Calyx 5-partite, 4 mm. Long. Flower-tube long, cylindrical, only slightly curved, thin, red-brown 8-10(-15) cm long, 4–6 mm in diameter, with a short spur at base of tube, 1–1.5 cm long, cream-coloured, sometimes suffused with purple. Corolla star-like, 50 - 60 mm in diameter, sparingly tomentose, opening into five, broad, petals which are subcircular, 1.6–2 cm. broad crinkled, white to pale cream-coloured. Stamens 4, subequal, inserted near the throat of the corolla tube; filaments 4–5 mm long. Style slender, equaling the corolla tube. Stigma reaching the corolla mouth or exerted by up to 10 mm., broadly bilobed. Fruits (capsules): Flat, pale greyish brown, woody approx 40-60mm long, 38-50 mm broad, heart-shaped, rectangular or egg-shaped in outline, laterally compressed, often with a blunt, notched tip sometimes with a long, rigid, hair-like strand resembling that of the jacaranda. It is thickened in the middle and stands upright. It splits open widely, to release the seeds. Seeds Brown, flat, transversely oblong, with round, papery wings, about 1.5 cm long and 2.5 cm broad (including the wings). Notes: The name lugardii honours Major EJ Lugard, a naturalist who collected plants in Namaqualand during the late 1800s. Cultivation and Propagation: Sesamothamnus lugardii is fairly easy to grow both indoors, as well as outdoors in warm climates in a garden with well-drained soil, especially a rock garden and can grow at about 10cm a year. In the winters it is deciduous, except in very tropical areas. It is drought but not frost-resistant. Growth rate: It is a fairly slow growing plant, but in 10 years it can easily outgrow its indoor location, requiring a 'pruning'. Though branching is usually a response to naturally process one can stimulate branching by cutting off its top. 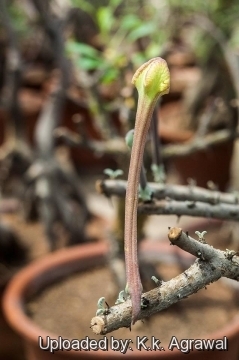 It has amazing regenerative properties and is suited for bonsai culture. Propagation: Seeds or cuttings. These trees are difficult to grow from seed, as planted seeds germinate poorly. Seed start sprouting in just 3-4 days ( but continue to germinate erratically for about 6 month). They are also propagated by removal of small offshoots that grow at the base of the old plant. Carefully break off the offshoots, they should be allowed to dry for 5 to 8 days before potting up.